Multiple stakes sire Coronas Fast Dash is returning to Royal Vista Ranches for 2016. WAYNE, OK�NOVEMBER 5, 2015�Bobby D. Cox's grade 1 placed and multiple stakes sire CORONAS FAST DASH has returned to Royal Vista Ranches, near Wayne, Oklahoma for the 2015 season. He fee has been set at $1,500. From a limited number of starters in three crops to reach the track, CORONAS FAST DASH has sired seven stakes horses (19%) and 15 winners with average earnings per starter of nearly $13,000. His top performers include Sign Of Corona SI 118 (6 wins to 4, $85,253 Les Bois Championship Challenge, etc. ), Red Corona Warrior SI 99 (2 wins to 3, $110,361 2nd TQHA Sires Cup Futurity[RG2]), etc., Coronas Fast Game SI 107 (4 wins to 2, $59,258 2nd Hawthorne Futurity , etc. ), Coronas Dawn SI 96 (winner to 3, $46,064, etc. 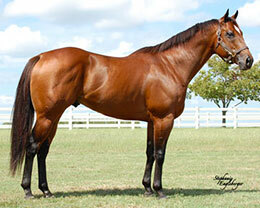 ), Heavenly Rain SI 93, f. Heavenly Prize Gal by Royal Quick Dash (3 wins to 3, $33,825 , etc. ), Tequila Tuesday SI 95 (4 wins to 3, $23,094 3rd Alberta Bred Futurity[RG3], etc. ), Steffis Fast Dash SI 122 ($20,579), etc. The son of #1 living sire of money earners, Corona Cartel, won or placed in nine of 15 starts, earning $156,412. He was second in the Heritage Place Derby(G1) and a finalist in the All American Futurity(G1), Dash For Cash Futurity(G1), Remington Park Derby(G1), Rainbow Derby(G1), etc. CORONAS FAST DASH is a full brother to Kindergarten Futurity(G1) winner Vachetta (3 wins in 3 starts at 2, $142,928). He is out of the stakes-placed and multiple stakes producing Heza Fast Man mare, Dash Fast Girl, a full sister to stakes winner Fast First Dash ($102,250) and stakes-placed First Black Rose, dam of stakes winner and G1-finalist First Black Wagon SI 95 ($87,283), multiple stakes-placed Love Me Madly SI 101 ($68,310 to 4, 2015), G3-placed Wild Ryde SI 95 ($35,355), etc. The second dam is the Dash For Cash mare First Prize Rose Too, a daughter of stakes winner First A Rose, who is a half-sister to all-time leading sire First Down Dash.